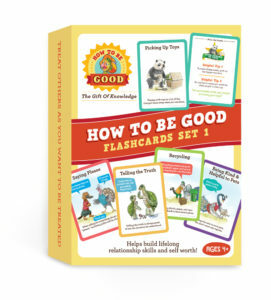 How To Be Good flashcards are fun, interactive, portable, and an efficient way to help children learn “the secrets” for how to be good for over 60+ individual behaviors. Our children’s behavioral flashcards appeal to visual learners. 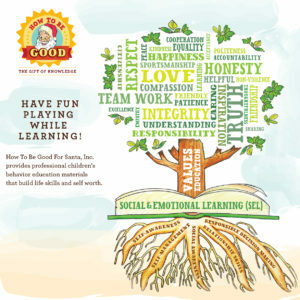 Over half of all children are said to have this type of learning intelligence. These children’s flashcards help build the following skills: memory, association, verbal, cognitive, interaction, listening, and more. 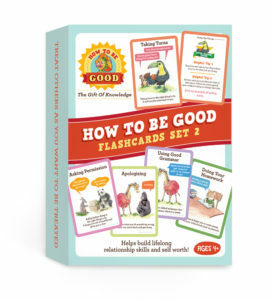 These educational flashcards are versatile and offer various learning/study methods. For example, you can shuffle or organize the order, stress certain behaviors or tips, and play memory & role-playing games. Memory games – The more children use the cards, the more the right and wrong behavior is ingrained in their brains. Role-play a story for each card or multiple cards. Share a card when on the spot behavior coaching is needed. Charades – Act out the behaviors in a fun way without offending others during non stressful times. Start a tradition – Countdown to Christmas while seeing how many nice traits and tips your child uses prior to Christmas Day. Use in correlation with Monthly Behavioral Tracking. Chart your child’s behavior using the Custom Gold Star Reward Stickers. These fun, interactive flashcards can be used as stand-alone products or in conjunction with the How To Be Good For Santa, Inc. goal planning worksheets, weekly worksheets, monthly behavior tracking chart, gold star reward stickers, activity books, picture books, and other products.